Rock and Roll concerts bring all sorts of people together to share in good music and good times. Last night my husband and I went to see a free concert courtesy of “The Drive” 97.1 FM radio station for their 11th Anniversary. 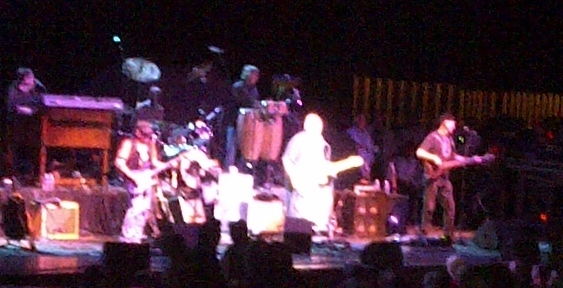 On the venue were Dave Mason and The Doobie Brothers. Dave Mason was inducted into the Rock and Roll Hall of Fame in 2009 and he played his familiar songs like “Dear Mr. Fantasy”, “Along the Watch Tower”, and “Feeling Alright”. He is 66 years old and played his guitar like he was 20. 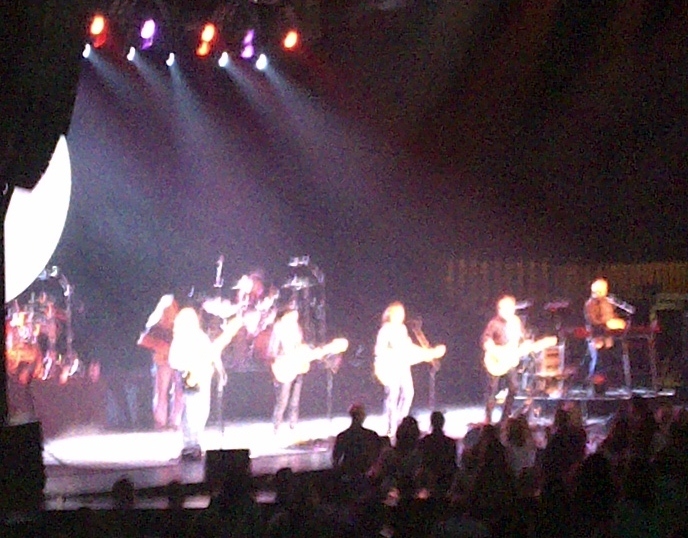 The Doobie Brothers who have toured since the 70’s, played old and new hits. They opened with “Jesus is Just Alright” They played other songs like “Takin it to the Streets”, “China Grove”, and “Black Water” bringing back memories of my teenage years. A few of their new hits were a little too country for me, but overall I enjoyed the music. I felt the concert to be more laid back than other Rock and Roll concerts I have attended. It could be that the crowd was older. However, there were two guys in front of us, who were not more than twenty-five, having a good time. They knew all the songs, and at one point, blew up a beach ball and threw it into the audience. Watching as the ball went up into the crowd, reminded me of pictures I’ve seen of Woodstock and Altamont where sweaty and high concert-goers stood, swayed, and jammed to the music. The two in front of us were jumping up and down excited to see the crowd responding to the ball, and it was a priceless moment. There were high fives and yelling when the ball made it to the stage and the guitarist from the Doobie Brothers kicked it back into the audience. I thought the two guys were going to wet their pants! Thank you to Chicago’s The Drive for allowing us the opportunity to share in a great musical moment. Classic Rock is still attracting music lovers both young and old. Long Live Rock!! Posted in Living the Life and tagged 70's, 97.1 The Drive, Along the Watch Tower, Black Water, China Grove, concerts, Dave Mason, Dear Mr. Fantasy, entertainment, Feeling Alright, Free concert, Jesus is just Alright, live in concert, music, postaday, Rock & Roll Hall of Fame, Rock and Roll, Taking it to the Streets, The Doobie Brothers. Bookmark the permalink. I saw the Doobie Brothers a few years ago. I don’t think all the original guys are still with them. A few of them are still together, but Michael McDonald was missing. I don’t actually believe that he has been with the band for a while. Still, I missed his voice. I could really tell the difference.